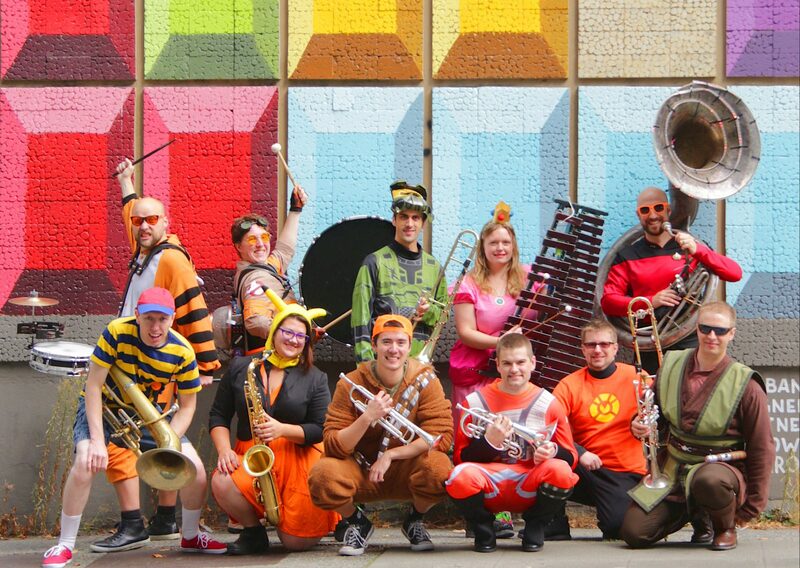 8-Bit Brass Band is your geeky local mobile brass band specializing in bringing our brand of brassy, bangy, and nerdly to the streets and stages of Seattle — and beyond! Do you think life sometimes needs a soundtrack? A surprise parade? A personal pep rally? So do we. We are a Seattle brass band with members on a mission to put a new twist on old favorites, and bring live music to the community. Find us at neighborhood events, parties, geek gatherings, HONK! Fest, or anywhere it would be fun to catch the sound of Mario funk or jazz Star Wars. Or, hire us for your next event in the Seattle area. Comes in formal orange tie or casual orangesplosion.